Ok, so I’ve got good news and bad news. Bad news first? I’m not going to sugar coat it… just gonna say it…I’m out of soda… my stock pile has run dry. I do have a few on the way, but this ultimately means I must go out and scour the earth for new things to drink. Actually I enjoy searching for new things to drink so this is sort of a happy time for all of us. The much anticipated good news is that today’s soda up for review is Virgil’s Blueberry Pomegranate! You may remember a few months ago a member of the Carbo-Nation reviewed this for us (C.W.) and loved it. Well fortunately for me he gave me a bottle that I can call my very own. Virgil’s Blueberry Pomegranate is all natural, 90% fruit juice, and that’s about it. There are no preservatives, caffeine, or gluten in this bottle… it’s pretty much 100% good stuff. That doesn’t mean it’s a health drink, but I’m going to go out on a limb and guess it’s healthier than your ordinary soda. Virgil’s Blueberry Pomegranate is a lovely rose color and dons the traditional Virgil’s bottle cap that sits atop the rest of their beverages. I must admit the typical Virgil’s bottle cap looks a bit odd on this because I’ve always associated it with cola’s, root beer, cream sodas, and the like. Maybe that’s just a bit off putting to me, but I’m crazy like that. Drink on! While the scent escaping form the bottle is light I can sense a whole host of fruity aromas. Apple is the strongest to me, followed by pear. Those two seem to barge ahead of any other potential fruit smells and hog most of my attention. The other scents sit quietly in the back waiting, hopefully, for their time to shine when consumed. There they are. Hi guys! Virgil’s Blueberry Pomegranate has a crisp and fizzy mouth-feel. The pomegranate really gets to shine throughout the entire duration of the consumption process. I’m struggling to taste the blueberry as Big Apple and Humungo Pear keep blocking him from my taste buds. This tastes a little fermented to me, but I know it’s not. That would normally be a huge turn off to me, but that aspect of the drink isn’t noticeable enough to sway me in a negative direction. The more I drink this the more I like it. The flavor never sits idle upon your tongue it feels like the 2nd sip every time. Obviously it can’t feel like the first sip every time or it would be as addictive as those addictive things kids are always taking as they ruin the blah blah blah and that’s why shoelaces cost so dang much. 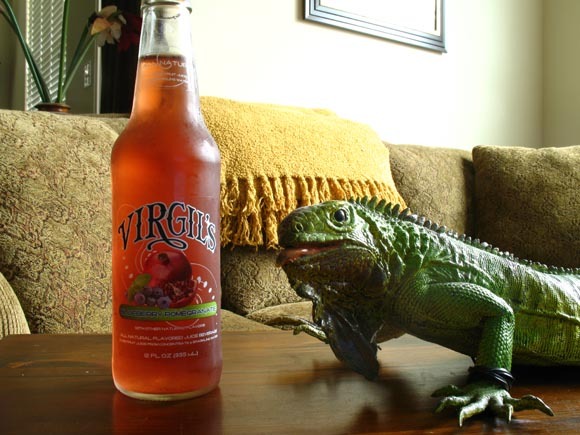 Virgil’s Blueberry Pomegranate is an “Anytime Soda”, meaning that this would go well with a meal or drinking is solo. Ingredient wise this should receive a perfect score, but the lack of blueberry takes it down a notch for me. I wanted so very desperately for blueberry to have the stage at some point, but the comically large hook keeps pulling him off. Other than this this was a fantastic drinking experience that I highly recommend to you. Thanks, Virgil’s. Thirgil’s.